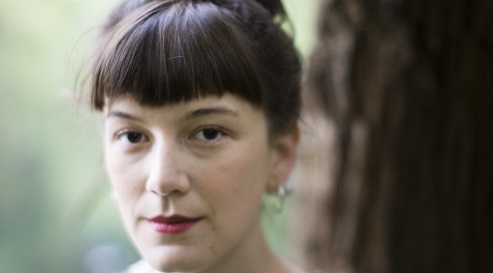 The Belgian poet Charlotte Van den Broeck (1991) studied English and German at university, and is now taking a degree course in Arts of the Spoken Word and Theatre at the Royal Conservatoire of Antwerp. She made her debut with the poetry collection Kameleon (Chameleon, 2015) which was awarded the Herman de Coninck Debut prize. Her second collection Nachtroer (Night Oar) was published in January 2017. Her works have appeared in various literary journals in the Netherlands and Flanders. Some of her poems have been translated into German, English and Arabic. Besides being a poet, she is also a performer. She has performed at various events, including the Night of Poetry in Utrecht and the Saint Amour poetry performance tour. Together with the Dutch author Arnon Grunberg, she performed their co-written poetic conversation book Ohne Nabel (Without Belly Button) at the opening of the Frankfurt Book Fair 2016. Van den Broeck and Grunberg also jointly write a weekly column in the newspaper De Standaard. Charlotte Van den Broeck was selected as one of Literary Europe Live‘s New Voices from Europe 2017.